Ollie Halsall - not only a guitarist but a keyboard player as well. Ollie Halsall should have been a guitar hero ages ago. Although this type seems to be somewhat out of fashion these days (Bill Nelson and Robin Trower being perhaps the only ones to have emerged in the last couple of years to have generated anything remotely like the excitement that Page or Clapton generated in their heyday) it seems as if in Ollie's case his talent has not been enough to ensure his being mobbed by hard-core guitar freaks. He would much rather keep out of the limelight, implying throughout the interview that his is a minor talent compared to that of the modern jazz maestroes who are his own heroes. Ollie has played with the cream of the British rock talent of the last few years, Jon Hiseman and Kevin Ayers are just a couple of names that have benefitted from his services and, of course, he first came to the public eye in a band called Patto, one of the finest British bands of the early seventies and one who were never as popular as they deserved to be. It's really about time that Ollie's guitar work got the credit that it deserves and perhaps now with the new band Boxer, who pack as hard a punch as their name would suggest, he may be exposed to the public properly for the first time. Halsall incorporates many facets of other people's playing in his guitar work, while managing to sound like nobody but himself. He can play as fast or fluidly as McLaughlin, as emotionally as Kossoff and with as much emphasis on electronics as Blackmore. Not only this but the man is a fine keyboard player and he spent a good deal of the interview talking about one of his favourite instruments -- the vibes. When he started talking about how he wanted to get back into playing drums also.well the mind boggles at what his musical limitations are! He has been a much respected and sought-after session man over the years too, not only for his guitar work, but for his keyboard playing -- a recent example being his vibes contribution on one of Robert Palmer's albums. Strangely enough, Ollie didn't play guitar seriously until relatively late in his career, although as a child he had messed about with a guitar at home. His first instrument as a youngster was drums. "I was constantly exposed to music as a child, I had two elder sisters who liked Johnny Ray and Gene Vincent and I think that they were the first artists who really got to me. One of my sisters owned a guitar and I messed about with it for a bit, but the instrument I first seriously took up was drums. I played in a band for about five years, we were called Rhythm and Blues Incorporated and from there I went on to vibes. I played vibes in a band called Take Five. At this point we were doing a lot of our own numbers and I was arranging a lot of other things as well. We used to do a Modern Jazz Quartet number which was a vibes showcase. Funnily enough we were just thinking of getting vibes back in the act the other day - I used to play them when I was in Patto, but I got a bit mad one night and smashed them up!" Ollie has a lot of theories about vibes-playing, and this instrument has never been really popular in rock, we talked for some time about what it was about vibes that Ollie liked. "Well, the vibes sound good mixed with another instrument. They blend really well. Vibes and electric piano is a really nice mixture. Also if you play vibes and another instrument in unison, like bass for example, that's a really nice effect too. And of course they are a really interesting instrument for soloing on. I like Milt Jackson and Bobby Hutchinson, two jazz vibes players, most of all I suppose. They show off the different attitudes to vibes playing that people have. You can either treat them like a percussion instrument or like a keyboard. Hutchinson really bashes them, he plays really percussively, whereas Jackson is a much more broad player, he plays in a very pure way - he treats the instrument much more as a keyboard. "Personally I like to treat the vibes as a percussion instrument - it's more like playing a drum kit than a piano for example. I'm also playing a lot of clavinet on stage now, and there again that has a very harsh percussive sound. I really like playing that, I'm aiming for a very American sound on it, it's real funky. I use an Echoplex on it at times - you can put the Echoplex in about an inch and you get a very slight echo, and that's the only effect I use at all." Doesn't Ollie use any pedals or effects on his guitar? "No, I don't like to. I play very organically - I like to think that there's nothing between the guitar and the amp to distort its natural sound. I tried a wah-wah pedal some time ago, but hated it. I don't really like instruments that are too electrical - I used a synthesizer when I was in Tempest and didn't like that at all. "One thing I do use a lot is the tremolo arm, but that's a mechanical thing after all. You can get some great effects using the tremolo arm; if you put the arm down and bash out a chord, you can make the guitar sound out of tune and really horrible and then you can change the whole sound by raising the arm up until the whole thing sounds in tune again. That's what I like about the guitar, it can sound like so many different things - it can resemble almost anything from explosions, drum sounds or more lyrical things. I use two guitars on stage at the moment. One is an old Gibson SG Custom which I've used for about 10 years now -really love that guitar, but it's in a bit of a dodgy state at the moment. "I'm hopeless with guitars - I fiddle with them with the result that they end up being in a worse condition than they were in the first place. That's what's happened with the Gibson. The more I tamper with it the worse it becomes so I leave it to other people now. I've given it to Andy who's working with Queen now to have a look at it, maybe he'll be able to help me out. My other guitar is a Fender Strat, which I've just started using, and I think that that guitar is more suited to my style at the moment, although I intend to go on using both of them on stage. They and my two hundred watts of Marshall are all I need!" Being a left-hander, had Ollie experienced any difficulty in getting guitars to suit him? "None at all. My first electric was a Telecaster which the roadies in the band I was with at the time remodelled for me. 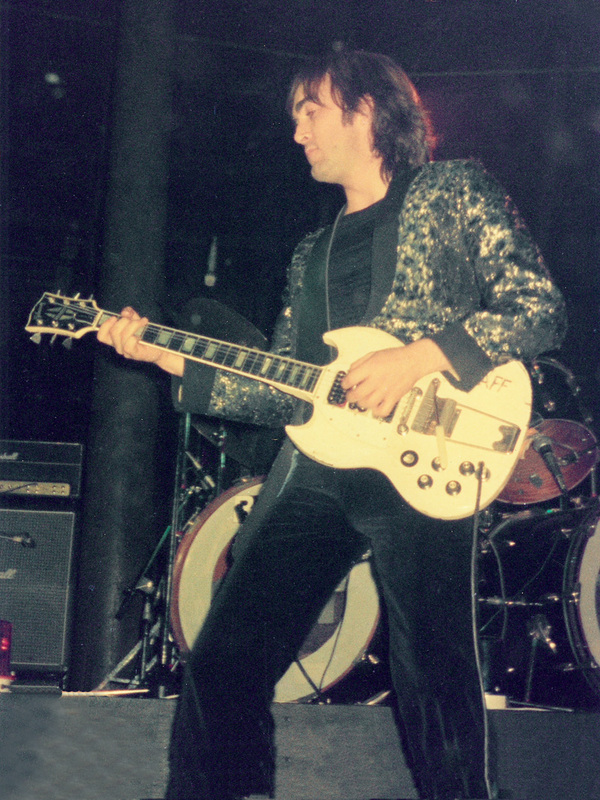 When I bought my guitars I noticed that whereas Gibson left handed guitars were about 50 per cent more pricey than the orthodox models, with Fenders left-handed models were the same price." Would Ollie ever consider using any other guitars than Fender or Gibson? "No, it's always been those two for me, although of course in terms of acoustic work I use a Martin, I play an awful lot of acoustic at home. In fact I use an old acoustic guitar of mine for composing on. It's a scaled down classical guitar - it has a regular sized neck and a small body, in fact it's a little bit like a six string ukelele. Usually when Mike Patto and I write together, I'll come up with a chord sequence first and he writes the words afterwards. I get ideas for music when I'm walking about or on trains or buses and then transpose those ideas onto the guitar." Ollie has wide and varied tastes in music. Broadly speaking he prefers jazz to rock music, but this doesn't prevent him liking such bands as the Four Seasons and The Beatles - in fact Ollie has always been a keen Beatles fan. Tempest, another of the bands that Ollie was in, used to do Paperback Writer and Boxer do a version of Hey Bulldog on stage at the moment. What about guitarists? Who would Ollie say had influenced him? "Charlie Byrd, Arthur 'Guitar Boogie' Smith, Buddy Holly and Scotty Moore, Elvis' old guitarist. Those are the people who went right into me. People like Hendrix and Clapton I was obviously aware of but I wouldn't say they really influenced me to any extent at all." 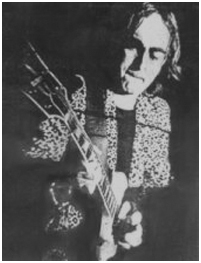 Halsall's slight jazz influence and his turn of speed has caused him at times to be likened to John McLaughlin. He laughs at the idea. "I'm not like him at all. I make mistakes! He's a lot more pure than I am - I think I'm slightly more raunchy." Another of Ollie's influences is the composer Stockhausen and he had one or two very strange tales to tell about this man's influence on people. "I used to live upstairs from the bloke who turned Hendrix on to Stockhausen. Apparently he played one of Stockhausen's pieces to Hendrix one day and the great man was so transported that he spent the duration of the piece writhing around on the floor tearing his clothes off! He's not had quite that effect on me yet though."